This bad conduct involves the area of property law known as “adverse possession.” Adverse possession is actually a type of trespass and theft that is actually allowed by the state government. It basically means the bad neighbor has trespassed openly on that land for so long, not only is the government not going to stop him from doing so in the future, it will actually protect him from any future attempt of the guy holding title to the land to take that land back from him. The state allows this because land should not remain idle, and if someone fences off your property against your will, you can’t just sit by and let them do it for decades before trying to stop them. There comes a time when you have just waiting too long to enforce your rights. Continuous. Use of the property must be continuous for the entire time period with no temporary absences. Hostile to the interests of the true owner. This implies that they do not have permission to be on the land. Open and notorious. The real owner notices that the trespasser is in possession. The use of the land must be visible. The one who is trying to acquire that land must show he is “openly and notoriously” occupying the land for a specified number of years, and treating that land as though he owns it. Possession must be exclusive, so there is no confusion as to who acquires the rights to the property once the time has run. Adverse possession does not work on property owned by the public. There are also cases that do not allow adverse possession to take effect including: disability, insanity, infancy, and imprisonment. 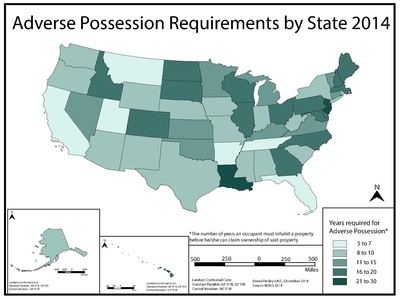 Adverse possession, in a way, is like homesteading. To gain the land, certain requirements have to be met. However, in homesteading, no one can be the owner of the land, and the first person to use it properly owns the property. 5. There cannot be, on file with the county land records, a document showing that you are occupying that land for a purpose other than ownership. In other words, you can’t claim the property is yours, via adverse possession, if you have been on that property for 20 years under a lease agreement with the real owner. The bottom line: It is not enough to be mad. It is not enough to wag your finger and complain about your neighbor’s bad conduct. If you want to keep that bad neighbor from owning your sliver of land that he has appropriated to his own use, you had better sue him before it is too late. You may need a court order establishing that he is a trespasser, not the new owner of the property.